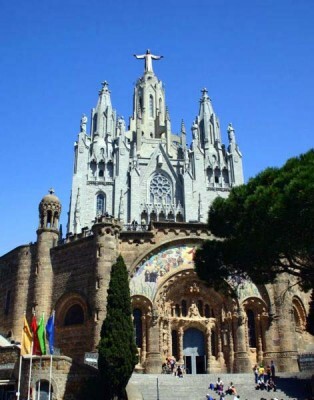 Tibidabo is the name of a mountain that is located in the northwest area of Barcelona, Spain. The top of the mountain has a Catholic church, a telecommunications tower and an amusement park. This mountain, at 1,679 feet tall, is the highest one in the Collserola mountain range. The summit offers visitors a beautiful panoramic view of Barcelona, as well as the Mediterranean Sea. Parc d’Attractions amusement park is over one hundred years old, and is the main reason many people visit Tibidabo. The park was very small when it first opened, and its initial main attraction was the railway that transported visitors to the top. These days the park is about 17 acres and has nearly 25 different attractions that range from a vintage carousel to thrilling roller coasters. It also has the Museu d’Autòmats which is a museum that has several old fairground machines that were made in the nineteenth and twentieth century’s. 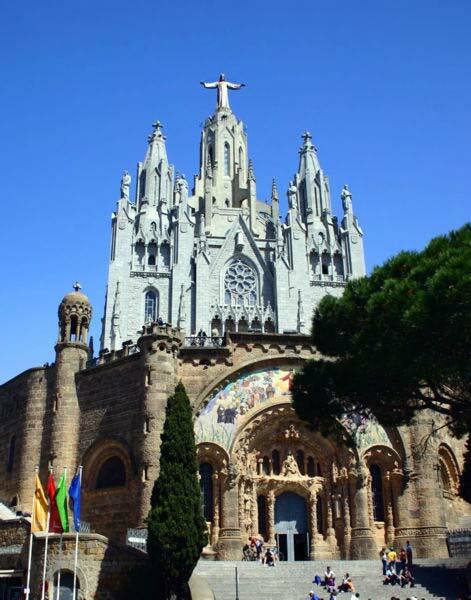 The white Church of the Sacred Heart on Tibidabo was built in 1902 and was designed by Enric Villavecchia. It took the place of the first building, a small chapel that was constructed in 1886. In 1909 the church’s crypt was completed. It was created in the Modernista style and has many colorful mosaics. Eusebio Arnau created many of the sculptures that are found in the crypt. The church has a neo-Gothic style and its interior is very colorful. There are stairways on both sides of the church that go to a balcony area which is atop the crypt. This area provides a wonderful view of Barcelona. Visitors can also take a winding staircase that takes them to the large statue of Jesus Christ, which is at the very top of the church. In 1991, a communications tower was set up on the top of Tibidabo. Visitors can take a glass elevator to an observation deck which also offers a breathtaking view of Barcelona.